Language acquisition begins long before infants speak their first word… in fact, it begins before they are even born! 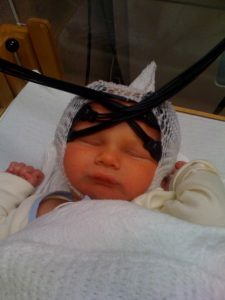 A newborn infant participates in our neuroimaging study at BC Women’s Hospital in May 2009. Newborn babies have been shown to prefer listening to the languages they heard while in utero than to other unfamiliar languages (Moon et al., 1993). In a study we conducted at the BC Women’s Hospital (May et al., 2011), we examined how prenatal language experience might shape the brain response to language in newborn infants. We measured brain activity using near-infrared spectroscopy (NIRS) while newborns listened to familiar and unfamiliar language. We found that brain activity differed when the newborns listened to the unfamiliar language (Tagalog) as compared to the familiar language (English). We interpret these results as evidence that language experience gained while still in the womb influences how the newborn brain responds to language across brain regions sensitive to speech processing. May, L., Byers-Heinlein K., Gervain J., & Werker, J.F. (2011) Language and the newborn brain: does prenatal language experience shape the neonate neural response to speech? Frontiers in Language Sciences, 2:222, 1-9. Moon, C., Cooper, R.P., & Fifer, W.P. (1993). Two-day-olds prefer their native language. Infant Behavior and Development, 16, 495–500.